For the last couple of days, there has been some rumors that the Yankees are gearing up for a blockbuster trade before the deadline. 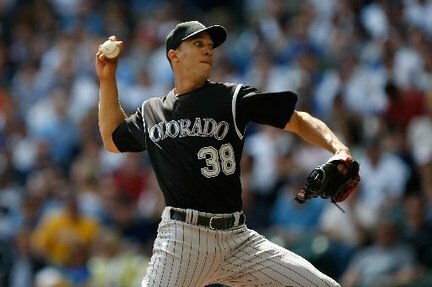 It appears that the Yankees are interested in Ubaldo Jimenez, given that there were a few Yankees scouts at his last start in Colorado. Now the chances the Yankees acquire Ubaldo are very slim. The righty has three years left on his contract, so the Rockies don’t have a reason to trade him. But rumors have speculated that the Yanks are willing to give up practically their entire farm system for the guy. As for my thoughts on this trade, I actually don’t have an opinion. The last time the Yanks executed a blockbuster trade was when they traded Austin Jackson for Curtis Granderson. When that trade went down, I opposed it. I loved Jackson, since he was our top prospect at the time. I knew Granderson was good, but I thought he was an outfielder who could only hit righties. Today, Granderson is one of the best outfielders in the league while Jackson is still trying to figure out big league pitching. So this time, I won’t root for or against this deal. I believe if we trade for Ubaldo and he becomes just as reliable as Sabathia, he’s worth the trade. But anything below those expectations, it wouldn’t be a good situation. Losing guys like Nova, Montero, Banuelous, Betances, and many others would be a huge blow if Ubaldo doesn’t become our second ace. So let’s ask you guys- Would you want this trade to go through? This entry was posted on July 21, 2011 at 1:09 pm and is filed under Yankees. You can follow any responses to this entry through the RSS 2.0 feed. You can leave a response, or trackback from your own site.